There have been several events across the USA this Spring – the Shelter in Place in Boston, the tornadoes in Oklahoma City and the fires here in Colorado – that bring to mind the need for each food allergy family to have an Emergency Plan. Your child no doubt has an Allergy Care Plan (or some similar name) for school. Does your family have an Emergency Plan for any of the possible emergencies that your community could face? You may be required to remain in your home, as those residents in Boston, MA had to do after the bombings. Or you could face the destruction of tornadoes or fires where you will have to evacuate your home – either temporarily or permanently. 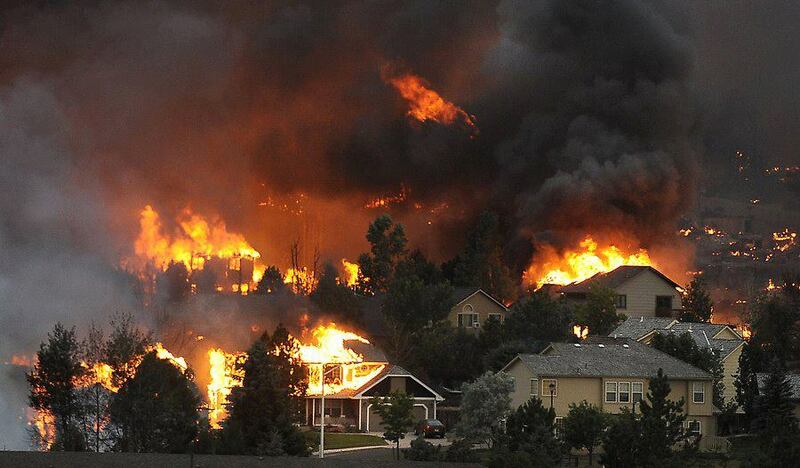 Until last year in Colorado Springs, we never thought we would have to evacuate our home for any reason. We have had to prepare for blizzards, where we ensure that we always have enough safe food for at least 3 days to last out the storm. However, we don’t have earthquakes, hurricanes, or tornadoes. And until last year, we never had a major fire in our area. Now, two years in a row, we’ve had life altering fires where hundreds of people have lost their home and thousands have been evacuated. At least three families who lost their home in the Waldo Canyon Fire in 2012, moved to Black Forest, and lost their home again in that fire this past week! We have come to realize the importance of having an emergency plan for our family. In the case of the recent Black Forest fire, all roads in the area were closed within 2 hours of the fire beginning. Once evacuation orders were put in place, the fire was bearing down on people so quickly that they only had 10 minutes or less to grab their essential items. Would you know what to grab in that amount of time? Do you have a safe place to be able to take your family? When you vacation, do you know the possible threats facing the area where you are staying? These questions and more need to be part of your plan. We have a ‘grab and go’ large folder for our “10 minutes and out the door plan”. This folder contains: our wills, recent tax returns, account numbers listing, passports, safe deposit box key, cash and other important paperwork. Understand Evacuation Terminology. 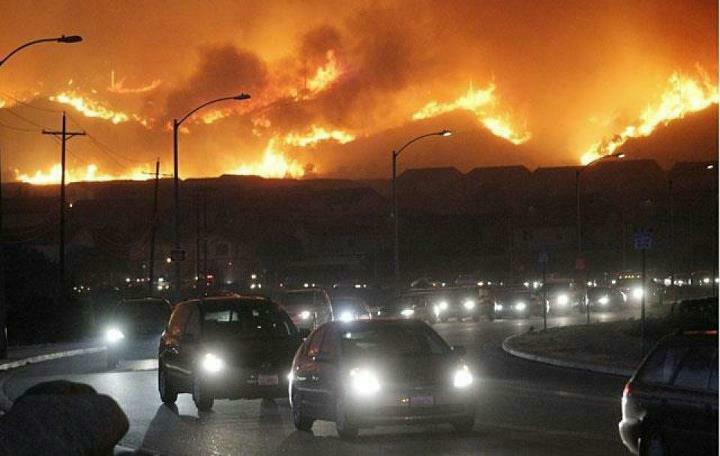 These definitions have been used throughout the fire evacuations in Colorado. We’ve learned to tune in to the radio and local news reports, Facebook and/or Twitter to keep up with the advancing evacuation notices AND to remain at home if we are placed on pre-evacuation with all items packed and ready to go. Pre-Evacuation – No immediate threat, but the danger may be moving closer; Prepare for possible evacuation. Pre-evacuation means there is no immediate danger to your home, family, or business, but the threat may be moving toward you. Voluntary Evacuation – The danger is moving closer and a mandatory order may be issued at any time. Officials say you do not need to wait for a mandatory order before leaving. Mandatory Evacuation – Leave now. You will not be allowed to return until after the threat has passed. The 5 P’s: People, Pets, Photos, Prescriptions and Papers. We don’t have pets, but if you do many evacuation centers won’t allow your pets to stay if you aren’t there with them. Hotels may not allow pets. For us, prescriptions were our big deal. Some prescriptions are very expensive, and we didn’t want to lose this investment when we evacuated last year. We also grabbed Morgan’s 504 Plan paperwork file and his Allergy Testing history file. Sure these could be recreated, but what a lot of work that would have been! If your child’s asthma care plan isn’t committed to memory, you might also want to bring that with you. Have a written list of evacuation items in addition to the 5 P’s. Have everything written on a list of what you would bring should you need to be evacuated. It’s so difficult to think of everything you need to bring in the middle of a crisis. This list could include clothes, computers, hard drive back ups, phone chargers, checkbooks, purse. Plan for your relocation. Know where you can go and what type of an arrangement you will need. Can you go to a shelter and have your child safely eat their food? Are you comfortable eating out every meal by going to a hotel? If not, what types of condos or extended stay hotels are in your area? Or within 100 miles of your area? Is it safe to stay with a family member? Bring Food with you. If you have ordered special food online, you certainly want to bring it with you because you likely won’t be able to have it mailed to you in time wherever you are staying. Even businesses, like specific grocery stores, can be in an evacuation zone. So if you get food from just certain stores, keep some on hand at all times. Be prepared to be gone for more than 72 hours. The officials told everyone here to pack enough clothes and supplies for 72 hours. Obviously those with burned homes won’t be back in a rebuilt home for probably a year or more. And others in the neighborhood won’t be allowed back in for months because of the gas and electric lines needing repairs. Many of them only packed for 72 hours and have had to get clothing, prescriptions and other supplies while they wait to be able to go home. Bring your nebulizer and peak flow meter even if they haven’t been needed recently. We learned this one the hard way last year! It would have been much easier to have had these items with us than to have to race off to the doctor’s office. Lesson learned! Plan for a rendezvous point. If your family members become separated, have an established location where you will meet. Having a plan in place will help you and your family to prepare for the worst, and hope for the best – that you’ll never have to put your plan to use! We have had the opportunity to learn about this subject first hand recently in June 2012. 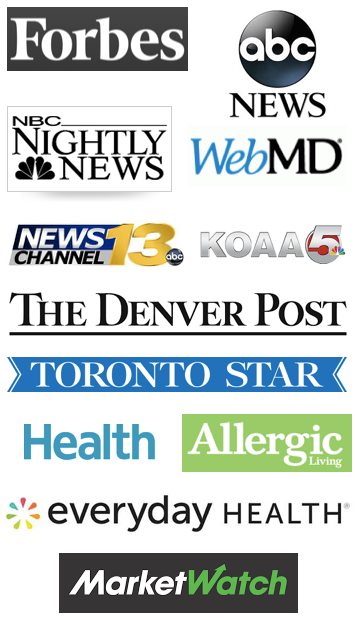 The Waldo Canyon fire in Colorado Springs has been a devastating experience for us but provided experience that we thought would be valuable to everyone managing food allergies and/or asthma when you have to evacuate your home. On Saturday, June 23, the fire began in a mountainous area near Colorado Springs in a canyon named Waldo Canyon. This is a hiking destination with beautiful views and an abundance of trees. Because of the extremely low precipitation we have received for the last 2 years – only 19% of normal – one cigarette dropped could have caused this entire situation. We also had experienced 100+ degree temperatures which is very unusual for Colorado, especially at this time of year. We live in an area northwest of Colorado Springs in Rockrimmon, which is in the foothills of the Rocky Mountains at 6500 feet above sea level. 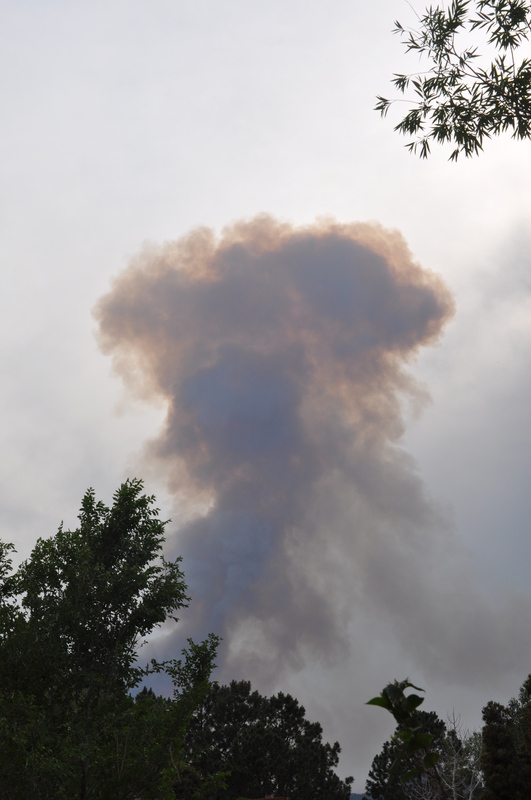 This pictures shows the smoke from the fire viewed from our home within two hours of the fire being reported. We immediately turned on the local news which was already beginning to announce voluntary evacuation notices. We sat down and created a list of what we wanted to take from our home. The news reminded us of the 5 P’s: People, Pets, Papers, Prescriptions and Photos. They were suggesting bringing 3 days worth of items, but we planned on bringing ALL of our prescriptions since we had no idea whether or not our evacuation would last only 3 days or 3 weeks. At one point, we received information from the local TV news that we were on voluntary evacuation. That’s when we began packing clothes and checking off items from our list. We decided that we would go to my husband’s office if we were evacuated. We couldn’t go to one of the local evacuation centers because of the inability to cook our own food not to mention the potential for coming into contact with Morgan’s allergens: peanuts, tree nuts, sesame, fish, shellfish & pets. And at that time on Saturday, my mother was out of town and we weren’t able to reach her to see if we could go to her house. We also took photos of all of the rooms in our house to include all of our household items. We just had an insurance review with our agent, so we knew our insurance was in good shape. We have “loss of use” in our policy which would allow us to go to a hotel if we were mandatorily evacuated and therefore didn’t have use of our home. We kept this in mind too since a hotel would allow us to be in air conditioning which would also help our son, Morgan, and his asthma. The voluntary evacuation notice went to a mandatory evacuation reported on the local news and we really jumped into action. Within 10 minutes, the news said they had made a mistake and in fact we weren’t in the evacuation area. We heaved a sigh of relief but continued to watch the news carefully knowing that this fire had already burned 150 acres in just a few hours. We awoke with more smoke in the air and concern for Morgan and his asthma. He kept his inhaler within an arm’s reach, and we insured that his Pulmicort was full. The fires didn’t really impact us that day in terms of growing in our direction, yet we decided to keep our bags packed just in case things changed. We confirmed with my mother that we could evacuate to her house should that become necessary. She lived nowhere near us, so that ensured we wouldn’t have to move again with the growth of the fire. We began to be complacent in our thinking that the fire wasn’t going to get near us. We continued to watch it grow on the news update maps, adding another thousand acres to become a three-headed monster. The picture opportunities were incredible with the blue sky and the plume of smoke in the air going over Colorado Springs. No additional evacuations were given and we went to bed feeling pretty good about the firefighters’ ability to fight this fire. There were smoke jumpers who parachuted into the steep terrain of the Rocky Mountains to sleep near the fire and keep watch on it. Once again we awoke to a layer of smoke blanketing Colorado Springs. Air quality was abysmal. Morgan stayed inside our air conditioned house enjoying it since once again we were forecast to have 100+ degree temperatures. 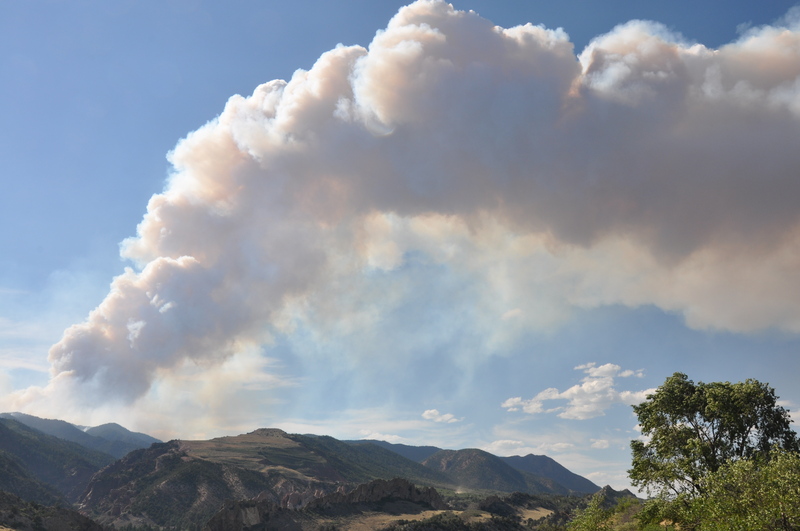 We could see the fire continue to expand during the day over the front range of the Rocky Mountains. 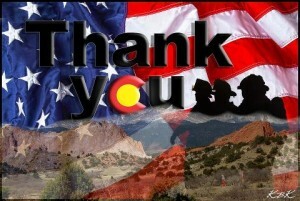 From the city of Colorado Springs, it was apparent that more was burning, but the fire command leaders were assuring us during press conferences that they were aware of the possibility of high winds and had fire lines in place in addition to 1200 firefighters on the front lines. They nor we had any idea what was coming! Colorado is renowned for dry thunderstorms, and one such storm began in the afternoon with winds whipping in multiple different directions, lightening striking but no rain. At 4pm, Morgan was home alone watching ash fall from the sky and called both Bob and I to say we better get home soon. The winds were 65 miles per hour and the unbelievable firestorm was raising the temperature near our home by another 10 degrees versus surrounding areas not affected by the fire. We weren’t in the pre-evacuation zone nor the voluntary evacuation area (the level up from pre-evacuation but not yet in the mandatory evacuation zone), but things were changing so quickly that Morgan began to pack in earnest. We are on the reverse 911 call list of our local Sheriff’s Office and knew that we would receive the call to leave if we became part of the mandatory evacuation area. My husband got home first after being one of the last people to get gas at the local station. 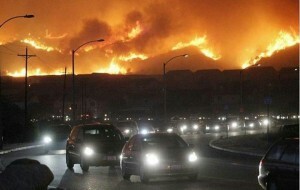 The traffic was horrendous as neighborhoods to the west of us were put on mandatory evacuation. The fire was roaring down the mountain shooting embers 1/2 mile ahead of the main fire creating more spot fires. We later learned that 65% of these embers started new fires. The fire was moving at more than 20 miles per hour. People were panicking because the fire was so close to us and they saw live embers starting small fires in the neighborhood. Some families had only minutes to pack up and get out of the way of the fire. We received the mandatory evacuation call to our home and cell telephone numbers at 6:30 pm and a text to our cell phones to evacuate immediately. I was just walking in the door having been caught in traffic trying to get back into the neighborhood. We were never on pre-evacuation orders nor on a voluntary evacuation list. We went immediately to a mandatory evacuation. We packed in expectation that we may never see our home again. My husband turned on the hose with a sprinkler to water the deck. We had heard on the TV that firefighters were turning off the gas and electricity in neighborhoods that were evacuated so we decided to pack up all the food that we could carry in coolers. We figured nothing would be salvageable in the heat without refrigeration for days. The smoke cloud was black and so densely thick that we put on breathing masks to protect our lungs while we began to pack the car. Ash was falling like snow, yet some pieces were the size of my palm. That’s a very difficult assignment to pack the right items when the brain and body are in shock. We left our house within the hour waiting for some of the traffic to clear and thankful that we weren’t seeing any live embers near our home. The fire had exploded in ways that the experts with over 30 years of experience in Level I firefighting, had never seen before. We drove the back route to my mother’s house and looked up at the mountains on fire. This was truly the equivalent of 9/11 for Colorado Springs. Never had I seen such destruction of our beautiful scenery. Watching tendrils of the fire snaking down the mountain I found myself sobbing. I was so grateful that we got out safely, and also so sad that what was left would never look the same in my lifetime. The news conference later that evening was sobering. 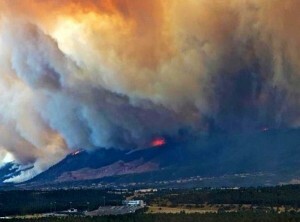 The mountains were on fire the likes of which no one in Colorado Springs had ever seen before. It was the worst natural disaster we had ever experienced. Our local neighborhoods were burning and in order to keep the firefighters safe, they were pulled out until their safety could be ensured. The scenes on the TV were surreal. We continued to watch the news coverage into the night at my mother’s house, grateful that we got out safe, and in fact 22,000 people were evacuated within a few hours with no accidents or injuries. That was nothing short of a miracle! We awoke having barely slept with the adrenaline rush from the night before. 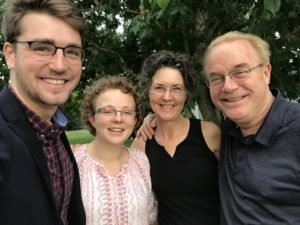 My mother’s small 2 bedroom townhome was not air conditioned, and between the heat, the smoke and the shock of the previous day’s events we were exhausted. The reality of our situation was hitting us. My husband had to go to work in Denver despite everything we had been through the previous day. He was pulled aside by some of his colleagues and told that he smelled like a campfire! We were so accustomed to smelling smoke, we didn’t even realize that our cars, clothing and suitcases were all smoke ridden. We were going to have to figure out how to keep Morgan’s asthma from flaring since he was no longer in air conditioning full time. By the time we were evacuated all of the hotel rooms in Colorado Springs were booked since 10,000 people had already left their homes before our evacuation notice. And because of Morgan’s food allergies, we needed an extended stay type of arrangement so that we could cook, and this too wasn’t available. With the lack of air conditioning, we wanted to open the windows, but the smoke prohibited that. Morgan remained inside with the windows shut and his inhaler within an arm’s reach. We were too exhausted to go anywhere else. Smoke covered the city making it smell like a campfire and ash was on our cars even though we were 4 miles from our home. We were now in a group called “evacuee.” It’s a group in which I never wanted to be a member. Yet we were offered showers at the local YMCA or a shampoo and blow dry at local hair salons. We were told on the local TV stations that the unified command center of the fire would provide representatives in a press conference daily at 8 am and 4 pm. Updates as to the progress of the fire and plans for the day of firefighting would be delineated in addition to information about evacuations. We could watch this press conference on local TV stations. 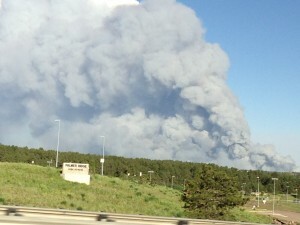 We continued to monitor local TV stations updates on their Facebook pages and watching the Twitter feed for #waldocanyonfire in addition to having the TV on constantly. We began to learn new firefighting terms such as pyrocumulus clouds, spot fires and containment. Planes continued to fly overhead dropping slurry and water trying to stop the spread of the fire. The number of firefighters ballooned to 1500, coming from across the state and the nation, with the fire becoming the number one priority in the nation. The firefighters, we learned later, pulled 48 hour shifts sleeping for only 3 hours on the pavement in order to save homes in and near our neighborhood. 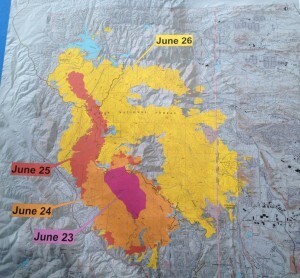 The 8 am press conference showed horrific progress of the fire on June 26, 2012 – Day 4 in my blog. The fire had tripled in size to 15,000 acres in one horrific day with only 5% containment. The evacuees numbered 32,500. From looking at the map we didn’t believe the fire reached our neighborhood. We continued to text, email and call neighbors and friends to ensure their safety. A neighbor told us that as he evacuated he saw a spot fire beginning in a park 1/2 mile from our home. That kept us cautious to hope too much. While our situation with food allergies and asthma was difficult to manage, we knew of other families with far more onerous circumstances. The 25 year old daughter of one family friend had been hospitalized since March with a traumatic brain injury suffered while skiing. Our friends evacuated their home to go sleep in her hospital room so that at least their family could be together in this difficult time. Morgan awoke with a horribly tight chest and his asthma flaring badly. We had kept the townhouse closed up during the night to keep the smoke out, but the heat in. His rescue inhaler wasn’t providing enough relief. In our quick exit from our house, we neglected to bring his nebulizer which he had needed only once in the previous 14 years. I called our allergist as soon as her office opened and got an appointment. Morgan was put on oral Prednisone, Symbicort and Albuterol via nebulizer. Our doctor suggested that he needed to be in air conditioning to help his asthma calm down. I called our insurance company to explain what was occurring and to see how they could help. Given that we were in a mandatory evacuation area under civil authority we were allowed to receive “Loss of Use” compensation for the inability to be in our home. This coverage would have paid for us to be in a hotel if we had the ability to find one and would have paid for meals if we could have eaten out. In our case, the coverage was going to purchase us a room air conditioner! We learned in the daily news conference that at least 346 homes had burned and an untold number were damaged. The destruction was mind boggling. And this estimate was likely to go higher as people got access to their neighborhood to survey smoke and water damage to the interior of their home. City officials posted online a list of 34 streets that had burned homes. These homeowners were asked to attend a community meeting to find out the extent of the damage to their home from a street view. Thankfully, our street wasn’t on the list, but many of our friends’ homes were. The fire was still increasing in size – up to 16,500 acres now but was 15% contained. We watched small fires burning in the hills above the church where Morgan’s Boy Scout Troop meets. We talked about how just a week ago if we would have seen smoke there we would have been so concerned. Today the conversation was more about relief that there were only a few fires burning that appeared to be small. Some homeowners in evacuation areas to the east of us were allowed to go home at 8 pm. Traffic jams occurred with people wanting to get back home by 8:01! These areas were still on pre-evacuation notice meaning that they needed to be prepared to leave again should the fire flare up. Our street wasn’t on this list either. With estimates from officials that the fire won’t be fully contained until July 16th, being home with the idea that we should be ready to evacuate again didn’t sound great, but it’s always nice to be home! Thankfully all of our actions the previous day helped Morgan to awaken with his asthma doing better and under control. The cooler indoor air along with getting stronger meds on board helped, but most of all the smoke haze had decreased somewhat. The recovery process was just beginning for people who found out their homes were gone or damaged. We continued to learn about friends whose homes were burned. Other friends whose homes are located in the most severe burn areas are suffering what seems to be survivor’s guilt. Like a tornado, one home was burned to the ground and the home next to it was untouched. In addition to that, many friends couldn’t access their home because smoldering fires in the adjacent burned properties continue to burn. Then, to add more insult, gas lines to surviving homes will probably take months to check and repair from the heat damage of the fires. By the end of the day, at 8 pm, we were allowed to go back home. 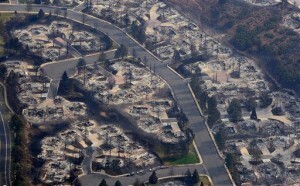 I can’t tell you how wonderful it felt to drive up our street and see our neighborhood green and untouched by the fire! Neighbors were calling out “Welcome Home” shouting through the dark to each other. Our home was unscathed by the fire, and thankfully no one looted the home while we were gone – a sad occurrence for some of our neighbors. The garage smelled like smoke, but we had inadvertently left on the air conditioning which filtered all the smokey air leaving barely a trace of smoke inside. A fine layer of ash was downstairs in the room closest to the garage, but the rest of the house had hardly any. Our Andersen Windows were worth the investment 10 times over! The Waldo Canyon Fire was the worst fire in Colorado history, “a firestorm of epic proportions.” In the 40+ years of living on the front range of the Rocky Mountains, we had never been evacuated from our home. Colorado doesn’t have hurricanes or earthquakes, and our area never has tornadoes. We’ve only been affected by fires from a distance when the smoke came into our air. We really weren’t prepared for what befell us. Now that we’ve had the experience of evacuation, we’d like to share some tips should you ever have to be evacuated with a child with food allergies and/or asthma. Remember to bring the 5 P’s: People, Pets, Photos, Prescriptions and Papers. As I wrote above, we took all of our prescriptions, not just a few day’s worth. Some of these prescriptions are very expensive, and we didn’t want to lose this investment! We also grabbed Morgan’s 504 Plan paperwork file and his Allergy Testing history file. Sure these could be recreated, but what a lot of work that would have been! If your child’s asthma care plan isn’t committed to memory, you might also want to bring that with you. Have a written list of evacuation items in addition to the 5 P’s. Have everything written on a list of what you would bring should you need to be evacuated. It’s so difficult to think of everything you need to bring in the middle of a crisis. Plan for your relocation. Know where you can go and what type of an arrangement you will need. Can you go to a shelter and have your child safely eat their food? Are you comfortable eating out every meal by going to a hotel? If not, what types of condos or extended stay hotels are in your area? Or within 100 miles of your area? Be prepared to be gone for more than 72 hours. The officials told everyone here to pack enough clothes and supplies for 72 hours. Obviously those with burned homes won’t be back in a rebuilt home for probably a year or more. And others in the neighborhood won’t be allowed back in for months because of the gas lines needing repairs. Many of them only packed for 72 hours and have had to get clothing, prescriptions and other supplies while they wait to be able to go home. Bring your nebulizer and peak flow meter even if they haven’t been needed recently. We learned this one the hard way! It would have been much easier to have had these items with us than to have to race off to the doctor’s office. Lesson learned! Overall, we are so thankful for everyone’s concern during this harrowing time in our city’s history. It’s an event that we will remember for our lifetime. Thank you to so many of you who donated allergy safe food and money to our local Care & Share food bank which has received over one million pounds of food since the start of the fire. We are especially thankful for the firefighter’s resolve to run toward the flames and save so many homes, including our own!